The dynamics of immigration, international commerce and the postcolonial world make it inevitable that much translation is done into a second language, despite the prevailing wisdom that translators should only work into their mother tongue. This book is the first study to explore the phenomenon of translation into a second language in a way that will interest applied linguists, translators and translation teachers, and ESOL teachers working with advanced level students. Rather than seeing translation into a second language as deficient output, this study adopts an interlanguage framework to consider L2 translation as the product of developing competence; learning to translate is seen as a special variety of second language acquisition. Through carefully worked case studies, separate components of translation competence are identified, among them the ability to create stylistically authentic texts in English, the ability to monitor and edit output, and the psychological attitudes that the translator brings to the task. While the case studies mainly deal with Arabic speakers undergoing translator training in Australia, the conclusions will have implications for translation into a second language, especially English, around the world. 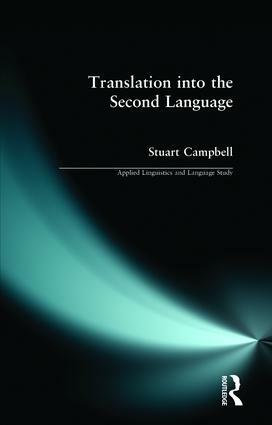 Translation into the Second Language is firmly grounded in empirical research, and in this regard it serves as a stimulus and a methodological guide for further research. It will be a valuable addition for advanced undergraduate and postgraduate students of applied linguistics, translation theory, bilingualism and second language acquisition as well as those involved in teaching or practicing translation at a professional level. Chapter 1: What is translation competence?